Specific lenses can be found by browsing the categories lens, lens maker, or lens mount. A photographic lens is an optical device through which light is focused in order to form an image inside a camera, either on film or a digital sensor. "Objective lens" or "photographic objective" are terms distinguishing such lenses from other types (such as magnifying loupes). While a substance such as glass may be entirely transparent, its density causes the velocity of light passing though it to decrease. As light passes between any two materials with different light velocities (such as between air and glass; or between two types of glass with different properties), a bending of light rays occurs. This is known as refraction, and is the basis for all photographic optics. Mathematically, this is described by Snell's Law. The etymology of lens is related to the word lentil; and in colloquial use "lens" means a single piece of glass with a curved surface—for example, a magnifying glass, or a simple eyeglass lens. However for photographic objectives, if reasonable aberration correction is desired, then a "lens" will be a composite design combining several individual "lenses." For clarity these separate glass pieces are termed elements. Elements may be classified as converging (light-focusing) and diverging (light-spreading) elements; also termed positive and negative elements, respectively. The sum of all the elements' refractive power must naturally be convergent (positive) to create an image-focusing camera lens. Two or more elements which are cemented together (without an air space between them) make a group. (In older lenses, elements were cemented together using Canada balsam, made from tree sap; newer lenses use high-tech UV cured adhesives.) Lens specifications state the optical configuration in terms of elements and groups: For a simple lens like the classic Tessar, this may be as simple as 4 elements in 3 groups—two of the elements are cemented together. In a modern wide-range zoom, the optical formula may involve dozens of lens elements. An early use of lens groups was in the correction of chromatic aberration—the tendency of different wavelengths of light to focus at different distances, giving color fringes in the image. This may be prevented by cementing together two elements whose optical glass has different properties. The first doublet of this achromatic type was patented over 250 years ago by the English optician John Dollond, although others had experimented with the idea before. Lens designers before WWII were obliged to favor designs which minimized air-glass surfaces, as reflections from these caused significant flare and light-loss. The development of antireflection coatings relaxed this constraint, and now air-spaced elements are used freely. Making a lens element is not as simple as just molding a piece of glass—that would be far too crude. After roughly shaping an appropriate type of glass, its surfaces must be ground until their plane or spherical concave or convex surfaces achieve the desired, mathematically-calculated curve. After grinding, the surfaces must be polished to be perfectly transparent. Modern lenses typically receive Some lens designs benefit from forming one or more surfaces into aspheric shapes, which requires methods different from traditional lens grinding. The transparent material for lens elements is most often optical glass. This is not the only possibility: Optical plastics are increasingly common; fluorite crystal is used in some high-performance telephoto lenses; some early lens constructions used elements filled with water; and some microscopes use oil-drop lenses. Another possibility is the mirror elements found in some super-telephoto lenses. Optical glasses are selected based on their power to refract light. A further division is in how this refractive power changes with different wavelengths (colors) of light, termed the dispersion of the glass. Crown glass is a very old kind of glass, once blown into a "crown" to achieve the round elements of medieval glass windows. Its better variants were also used as optical glass Flint glass is made with a high proportion of lead. Modern lenses may employ optical glass with highly-engineered properties, such as the ED glass whose dispersion (change of refractive index with wavelength) is very low. The barrel is the outer shell that contains the lens elements, having a roughly-cylindrical shape. Besides its mechanical function in maintaing the correct spacing between elements, it typically includes mechanism to permit focus (moving some or all of the lens elements forward and backward); aperture adjustment; and (in the case of zoom lenses) complex cam mechanisms to move several lens groups independently. The aperture is a opening, typically centered between the lens elements, which limits the amount of light passing through it into the camera. The lens's optical axis passes through the centre of that hole, which is shaped to be at least approximately circular. It is usually adjustable in diameter, although a waterhouse stop arrangement is still seen in very simple cameras. A diaphragm or iris is a round aperture of variable size, controlled either via autoexposure or with an aperture control (often but not always found on the lens barrel). Besides adjusting the light intensity passing through the lens, smaller lens apertures increase depth of field. The term aperture is also often used to describe the f/ratio in use, for which the diameter of this opening is one determining factor. 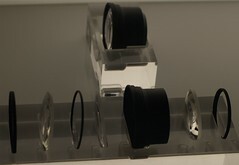 A lens mount is the part of an interchangeable system lens that connects to the camera body. Different manufacturers have created many lens mount standards, using a variety of threaded, bayonet, or breech-lock mechanical attachments. A key difference between mount standards can be their flange focal distance. The optical axis is an imaginary straight line which passes through the centers of curvature of the lens elements and meets the (untilted) focal plane at a 90-degree angle. The optical center is a point along the optical axis which is the (theoretical) center of the optical design. In the case of symmetrical lens configurations, this is often close to the location of the aperture stop. In the case of retrofocus designs, the optical center will be behind the physical center of the lens; while in a "true" telephoto design it will be ahead of it. The focal plane is the plane onto which a lens projects the image of the focused image subject. Usually it's flat but especially some old bakelite cameras with just a simple meniscus lens have a curved image plane since the "curvature of field" of such lenses is stronger than that of more sophisticated multi-element lenses which deliver more or less "planar" images. Usually the middle of a focal plane sits at a 90-degree angle to the optical axis, except when tilt/shift movements cause deviations from a camera's normal geometry of light-pathes. The position of the film's or digital sensor's light sensitive surface should be identical with the focal plane. The focal length of a lens is the distance on the optical axis from the focal plane to the optical center of the lens when it's focused to infinity. In modern usage, this is expressed in millimeters; but older lenses may state focal lengths in cm or inches instead. Focal length is a convenient but unfortunate measure of lens angle of view since this will depend on the format. A "standard" 50mm lens for 35mm film cameras would be wide angle for 6x6cm film cameras, and tele-photo for small format digital cameras. Furthermore, in any format, angle of view is only approximately proportional to focal length. For longer focal lengths the approximation is close, but for wide angle lenses the angle of view is only loosely related to focal length. For example in the 35mm format: a 50mm lens gives 45 degree angle of view, 100mm lens 25 degrees (close to but not exactly half as might be expected). However a 24mm lens yields 84 degrees angle of view, considerably less than double the 50mm lens angle of view. Focal lengths scale in proportion to the size of the film or digital sensor image format used. That is to say, a 135mm focal length would function as a long telephoto on a Micro Four Thirds camera; while for a 5" x 7" format view camera it would be a wide-angle lens. As no mechanism for changing lenses needs to be built into the camera design it can help keep the camera smaller and lighter. In digital cameras a fixed lens means that there is less chance of introducing dust to the sensor surface. Fixed lenses are designed for a specific camera model and so fewer compromises have to be made in the lens design. Cost - if your camera comes with a fixed lens you don't have to worry amount buying a lot of additional glass to build a system. Portability - a fixed lens should be enough for most situations you encounter so you have less accessories to carry and you will waste less time changing lenses. A larger range of focal lengths and specialties (shift, macro, etc.) are available than you are likely to find on any fixed lens camera. Each lens can be designed for a specific kind(s) of working situations and specialties without the compromises a generalist fixed lens has to be designed for. Longevity - you can upgrade your camera body without losing any investment you have made in additional lenses if your new camera choice is in the same family as your old camera. A given interchangeable lens body can accept one type of lenses. There are cases of compatibility, when different bodies share the same lens mount. Adapters can exist to put a lens designed with one type of lens mount on a body designed for another. Auxiliary lenses - if your camera has a fixed lens there are accessories available that allow you to enhance your fixed lenses range. These included close-up lenses that allow your camera to focus closer than it naturally can. They also include wide-angle attachments that allow your fixed lens to capture more of a scene than it otherwise could. They also include popular telephoto attachments that allow your fixed lens to reach further than it otherwise could. Telephoto attachments include extreme digiscoping lenses. Digiscoping is the practice of mounting a digicam on a spotting scope of telescope to create extreme focal lengths. As with all photographic equipment, auxiliary lenses range in quality from the truly dreadful to the professional. Bear in mind that any auxiliary lens that you attach to your fixed lens is adding more glass between the subject and the film. As such it is bound to affect image quality and the amount of light passing through to the film plane. Cheap auxiliary lenses add horrible distortion and purple fringing to your shots. Auxiliary lenses are a compromise solution to extending the range of a fixed lens that can provide good results but there appear to be no bargains in this niche marketplace and you will get what you pay for. For a list of lens mounts, see Lens mounts. The term prime refers to a lens with a single focal length. Typically, prime lenses (except repro lenses) have larger maximum apertures, so they are able to let in more light than similar zoom lenses. This makes prime lenses more suitable for low-light photography. 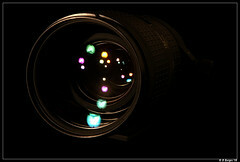 A zoom lens is a compound lens with a variable effective focal length. Shifting the focal length of a zoom lens allows the photographer to modify the framing of a photo without moving. By allowing a photographer to work closer or further from the subject, zooms can also offer different options in perspective. Compared to prime lenses, zooms are bulkier, and often prone to greater geometric distortion (typically, barrel distortion at wide-angle settings and pincushion distortion at long ones). The vast majority of digital cameras come equipped with Zoom lenses. The zoom ratio is the ratio between the shortest focal length and the longest focal length of a given lens. The majority of modern zoom lenses are about 1:3, meaning that their longest focal length is 3 times the shortest. 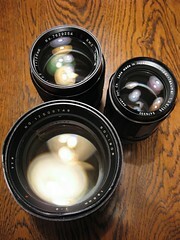 For example, there are many 35-105 lenses available. As the ratio gets bigger, the lens becomes much harder to manufacture, and more expensive. Some modern digital cameras have zoom ratios of 1:10, or even 1:12. It may be that such a camera could lessen the need for interchangeable lenses, and perhaps these will become more of the norm. Currently, they represent the leading edge of consumer optical technology. Frequently, lenses for digital cameras are labelled with a "35mm equivalent" focal length. This gives a way of comparing zoom ratios between film and digital cameras. In any case, divide the larger number by the smaller. If the result is less than 3, then it's unimpressive. If it's about 3, then it's a normal, conservative design. If it's much greater than 4, some testing might be in order. In general, the shorter the focal length of the lens, the wider it's angle of view. It's much easier to get very wide angle lenses for film cameras than for digital, unless you are talking about very expensive digital cameras. Many digital cameras suffer from a lack of wide angle ability, and if that's important to you, that will affect your choice. If you must have very wide angles, you will need to get a camera with interchangeable lenses, whether film or digital. Some lower cost digital cameras can be fitted with add-on lenses that increase their angle of view. 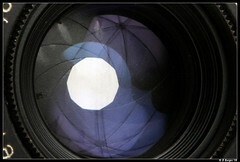 In 35mm cameras, a 50mm lens is said to give an angle of view similar to the human eye, though many people dispute this. Nevertheless, this has come to be called a standard lens for 35mm cameras. A normal lens has an angle of view that approximates how the human eye sees a scene. A lens is considered normal when its focal length is approximately equal to the diagonal of the film format. Lenses shorter than normal are called wide-angle, while those longer are called telephoto. In 35mm photography, 50mm is considered to be the normal focal length, even though the actual diagonal of the frame (24mm x 36mm) is 43mm. For medium format photography (frame size 2-1/4" square, or 6x6cm), normal is generally 80mm. A wide-angle lens is a lens with a focal length shorter than normal; that is, smaller than the diagonal of the image format. A rectilinear wide-angle lens is one reasonably free from geometrical distortion—straight lines appear straight although they may be converging. By contrast, fisheye lenses render peripheral straight lines as curves. Rectilinear wide-angles may include 65° to 120° coverage as measured on the diagonal. While geometrically accurate, this wide coverage can create an impression of distorted perspective which increases as the focal length of the lens decreases. The rear element of a wide angle lens can be very close to the film plane and for reflex cameras retrofocus lenses had to be developed. In a retrofocus design the theoretical focal point lies behind the rear of the lens. Although more difficult to design and manufacture, retrofocus lenses also have the advantage of more even illumination across the image (i.e. less vignetting). A fisheye lens (see below) is an extreme case of wide-angle lens; by permitting gross barrel distortion, angles of view of 180° and beyond may be included. A long-focus lens is any lens with a focal length longer than normal. That is, its focal length will be twice the image diagonal or greater. These lenses have a smaller angle of view than a normal or wide-angle lens. Focal lengths in the range of 2 to 3 times the image diagonal are often termed portrait lenses. To avoid exaggerating a person's nose, the camera should stay back at least 4 feet/1.25m; a portrait focal length can fill the frame with a face at this distance. A very long-focus lens brings far subjects closer, like a telescope. The longer the lens, the more likely that camera shake will blur the image; for this reason, longer lenses are frequently used with a tripod or other support to steady the camera. Originally, a telephoto lens was a particular optical design used in the construction of many long-focus lenses. A simple telephoto lens has a convex lens group at the front and a concave lens group at the rear. This optical design results in a lens with a physical length shorter than the optical focal length. The distinction between "long lens" and "telephoto" is significant to view camera photographers, since it affects the bellows extension required. Most photographers use "telephoto" to mean any longer-focus lens, regardless of its optical construction. In general, fisheye lenses are expensive and little used in everyday photography. They are used for measuring, scientific research tasks, especially meteorology, illumination studies, botanic studies on trees. Fisheye adaptors: auxiliary lenses are available that simulate a fisheye field of view. This is a cheap way to play with the fisheye effect without investing in a dedicated fisheye lens, although, as with most auxiliary lenses, the quality of your images will not be the same as those taken using a 'real' fisheye. Macro lenses are lens heads for SLR's supplementary bellows, or belong to the macro subclasses of wide-angle lenses, normal lenses, mainly zoom lenses, and even tele lenses (telemacros). Macro means that macroscopic exposures are possible since these lenses allow very near image subject distances. Wide-angle lenses may allow distances of 20 cm. On most zoom lenses near distances cannot be chosen directly. Those lenses have to be switched to a special macro mode. Modern digicam zoom lenses have macro modes for minimal image subject distances between 1 (!) and 10 cm. Lenses with a longer tube elongation added may allow shorter distances. Such elongations are usually reached with supplementary macro bellows or macro rings. On top of a macro bellows nearly any sort macro lens head, normal lens, wide-angle lens or zoom lens can be used for macro photography, even if the lens is not explicitly sold as macro lens. For macro lenses or lens/elongation combinations the maximum reproduction scale (or reproduction ratio) is a characteristic parameter. For example a reproduction scale of 1:3 means that the object focused in shortest distance will be reproduced in one third of its original size. Only on a print will it appear enlarged. A reproduction scale of 2:1 means that the object focused at the shortest focusing distance will be reproduced in twice its original size. It will appear enlarged on the negative. Repro lenses are not constructed for speed but for sharpness. Many are made for making images of frame sizes greater or equal 9×12cm. And many allow short subject distances. These lenses are ideal for reproducing two-dimensional objects. Used on long bellows repro lenses are good macro lenses. Another usage is making images of still objects in studios. Naturally repro cameras need this sort of lens. 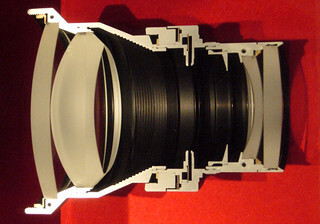 Many repro lenses, even some for smaller frame formats, are constructed apochromatic. Some lenses are optical adapters allowing to use cameras with microscopes, endoscopes or telescopes. Others are converters to be mounted between camera and lens to give the lens twice of its original focal length. the speed, the larger the lens diameter. Virtually all lenses are labeled with a number giving their maximum aperture or lens speed, reflecting the importance of this parameter. Lenses that, relatively speaking, let in a lot of light are called fast or bright lenses. So for example an f/1.4 lens is one stop faster than an f/2 lens (it admits twice as much light). Fast lenses are important if you want to take photos in dim light without flash or a tripod, or if you desire shallow depth of field. As lenses get faster, they become larger, heavier, more difficult to make, and more costly. Maximum aperture is often a major differentiator between a manufacturer's various lens price/quality levels. "Fast lens" is a relative description: It depends on the image format and the focal length. A lens's widest f-number is the focal length of the lens divided by the diameter of the widest diaphragm opening (or strictly speaking, its entrance pupil). Longer focal lengths require larger lens diameters to yield the equivalent f-number; and so e.g. the fastest lenses available for large-format view cameras will rarely be faster than f/4.5. In contrast, the short focal lengths used for 8mm and 16mm movie cameras, or video security cameras, may routinely be f/1.4 (even for zoom lens designs). In the context of 35mm film, (using a 24x36mm image size), the fastest available lenses will be in the focal length range of 35mm to 85mm. In this range, fast lenses of f/1.4 are available—or more rarely, even f/1.2 (one-half stop brighter). For a telephoto of 200mm focal length, f/2.8 would be considered a fast lens; while a maximum aperture of f/2.0 would be exceptional (and dramatically larger, heavier, and more expensive). Early 35mm cameras were supplied with f/4.5 or f/3.5 lenses; but by the 1970s f/1.8 or f/1.4 normal lenses had become commonplace. The industry's subsequent shift towards zoom lenses sacrifices a stop or two of lens speed, particularly when these are zoomed to the long end of their focal length range. A zoom designed to maintain a constant f/2.8 maximum aperture across its focal length range is "fast" in that context, but at a significant penalty in weight and cost. Depth of field is the depth of the in-focus zone in a photographic subject. When the camera is focused at a certain point the image will be in acceptable focus for objects slightly in front of that point, as well as slightly behind. The distance between the closest object in focus and the most distant one is depth of field. The depth of field is dependent purely on the geometry of the lens, specifically the magnification and aperture (magnification at the film or image sensor, not viewing size). The general perception is that wide angle lenses have greater depth of field than telephoto lenses, and while this is common experience it is not strictly correct. For a given aperture, depth of field is directly proportional to magnification. For example, viewing a subject with say a 50mm lens and then changing to 100mm the depth of field immediately reduces because magnification has doubled. But, if with the 50mm lens, the photographer moves forward half the distance (doubling magnification) depth of field will be reduced by the same proportion. Anyone taking close up photographs knows that depth of field reduces dramatically when closing in on a subject for exactly the same reason. Magnification increases as subject distance is reduced and depth of field reduces also. Magnification in this context means the ratio of the subject height to the height of the image formed. Thus, the smaller the image format of the camera, the greater the depth of field, all other factors being equal (f-ratio, distance, and lens angle of view). Compact digital cameras with extremely tiny sensors inherently give greater depth of field, even when fitted with a wide-aperture lens. A fast lens set at its widest apertures will give shallow depth of field. Using a very fast lens allows photography in dim light, but it may be very difficult to focus accurately. However, a 50mm f1.0 lens set to f4.0 will have exactly the same depth of field as a 50mm f2.8 lens set to f4.0. 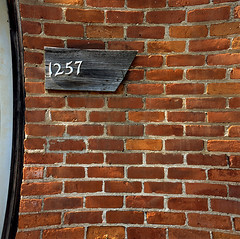 It is the working aperture that matters not maximum aperture. Geometric distortion is when a lens represents straight lines as curved ones. This can be often seen in zoom lenses, at both extremes of the zoom range: straight lines at the edges of the frame may bulge in or out. Whether this is objectionable depends on the type of pictures you take. It will usually be bad with architectural pictures, or with pictures full of geometrical shapes, and for the reproduction of documents, paintings etc. It will usually not matter for portraits and for landscape shooting. Also modern image-editing software often provides simple tools to counteract lens distortion. It may be difficult for lens manufacturers to achieve very low distortion in conjunction with all the other desirable features they want their lenses to have. It is a particular challenge to design wide-angle lenses for SLRs which are low in barrel distortion. When straight lines bow out towards the edge of the frame (like the profile of a barrel) it is known as barrel distortion. This is typically found to some extent at the wide end of many zoom lenses. 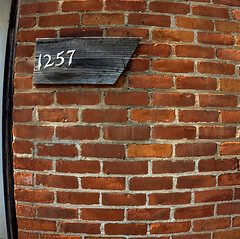 A fish-eye lens is a design where extreme barrel distortion is included deliberately. When straight lines bow in from the frame edge it is known as pin-cushioning. This is typically found at the long end of zoom lenses. A more complex form of distortion where the degree of barrel or pincushion distortion varies across the field; lines may take on a wavy appearance which simple software tools cannot correct. Most lens faults with optical effects are called aberration. Astigmatism is the condition when a point of light in the scene cannot be projected as one point behind the lens. It appears as a line on the focal plane. Another explanation is that astigmatic lenses cannot project horizontal lines into the same image plane as vertical lines. That effect mainly appears when biconvex or biconcave lens elements are used. In the case of the biconvex lenses in our eyes astigmatism can be corrected by a lens element with reverse astigmatic effect (cylinder lens). The only possible correction of astigmatism of camera lenses is to combine at least 3 lens elements. The different elements of a well-constructed triplet minimize astigmatism. For more than one hundred years most photographic lenses have been anastigmatic, but the term was still used for marketing camera lenses until the 1950s. There is a page on chromatic aberration in the wiki. Chromatic aberration is the tendency of a lens to focus short wavelength (say, blue) light more rapidly than longer wavelengths, leading to blurring and color fringes in the image if severe. It may be reduced during lens design, by combining elements made of different varieties of glass in an achromat or apochromat. Elements made of different glass help to bundle red, green and blue light that is coming from one single point in front of the lens in one single point behind the lens. the green light shares of the light coming from a blue/green (cyan) light mixture. Modern lenses are coated with a very thin layer of material such as magnesium fluoride or calcium fluoride which is applied to each element of a lens that has a surface exposed to air. The purpose of this coating is to reduce flare by minimising reflection from the internal surfaces of the glass. Reflections from a coating whose thickness is one-quarter of a wavelength of light (about 140 nm) destructively interfere with reflections from the glass itself. Some remaining light may be reflected at other shorter or longer wavelengths, giving the lens surface a colored appearance. But coatings have little effect on the color correction of lenses, simply reducing internal reflections. 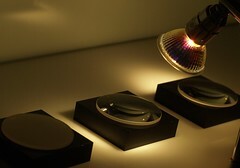 Multicoating refers to the application of more than one layer of coating on a lens, reducing reflections further and over a wider band of wavelengths. Since lens coatings are relatively fragile, care must be taken when cleaning lens surfaces so as not to damage the coatings. Many photographers keep a daylight or UV filter on the lens to protect its surface and avoid the necessity of frequent cleaning. ↑ See the article "Snell's law" in Wikipedia. ↑ Rick Oleson has posted an explanation of how lens coatings work. This page was last edited on 15 June 2016, at 10:34.